People tend to think of New Zealand as a tiny little country tucked away in the corner of the globe, much smaller than continents like Australia, Europe, or Asia. But a groundbreaking new discovery suggests that couldn’t be further from the truth, with prominent geologists saying that the islands we know as New Zealand actually appear to be part of an enormous underwater land mass called Earth, or The Planet. The case for this extraordinary claim was made in a paper recently published to GSA Today, the journal of the Geological Society of America. The paper’s chief author, Nick Mortimer, says the magnitude of the discovery cannot be underestimated. What we thought was the Pacific Ocean may just turn out to be “kind of a giant lake” in “this greater continent of New Zealand,” he added. 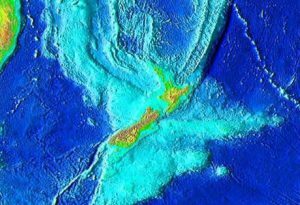 Prime Minister Bill English and Foreign Minister Murray McCully both said, when asked, that they were “looking into” the territorial implications of the discovery, and whether New Zealand was potentially entitled to “most of” the planet. “Yeah, I mean, if it’s all connected,” he said. This week’s discovery comes just a year on the heels of scientists rethinking whether the Earth’s oceans are all “one big ocean,” after satellite images revealed there are no actual lines between them.